National University Student Population: Who Goes Here? Educate Yourself on Diversity at National University, Including how Similar This School is to Others in the Nation. 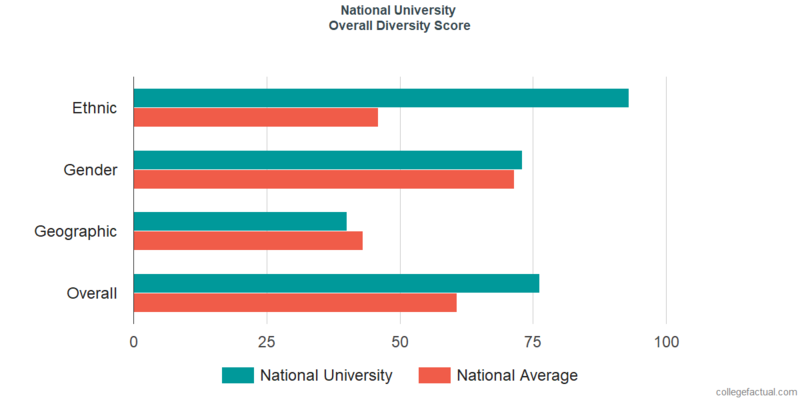 Considered above average in terms of total diversity, National University is ranked #434 nationwide. This very diverse school may be a great place for young students to get to know others with different cultures and backgrounds. National University is ranked #54 in ethnic diversity nationwide with a student body composition that is far above the national average. 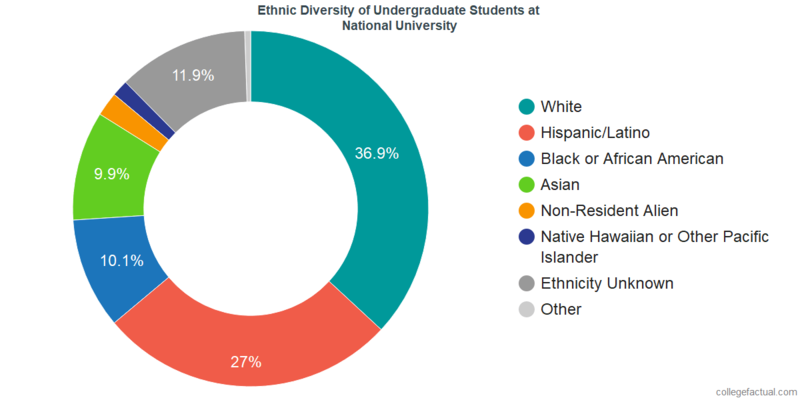 The chart below will display the diversity of undergraduate students at National University when it is available. National University boasts excellent ethnic diversity. At National University, the disparity between men and women on campus is lower than the national average. The undergraduate student body at National University is equally balanced. This university is ranked at #675 in male to female diversity nationwide. The undergraduate population is comprised of 3,718 males and 4,601 females. If available, the chart below includes the male to female ratio among National University's undergraduate students. The disparity between the counts of men and women at National University is lower than the national average. If available, the chart below includes the male to female ratio among National University's faculty. The ratio of male to female faculty at National University is above average. Would you prefer a local college that recruits students from within California? This could be a good option for you. We've determined the geographic diversity of each school by looking at where students lived before they attended college. 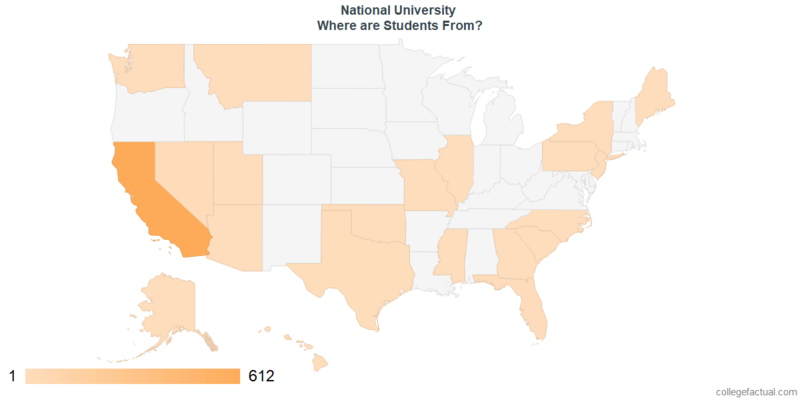 Over 90% of the students attending National University come from within California. This means National University is below average in geographic diversity with a ranking of #1,545. The undergraduate student body is split among 7 states (may include Washington D.C.), as shown in the chart below. There is a mid sized group of about 428 international students at National University representing at least -1 countries. Check out the National University International Student Page for more information. The "traditional" college student is thought to be between the ages of 18-21. However, this university appears to attract a majority of older students. At National University, 5.9% of students are in the age 18 to 21 bracket, compared to the national average of 60%. We rank National University #1,035 in the nation for student age diversity. 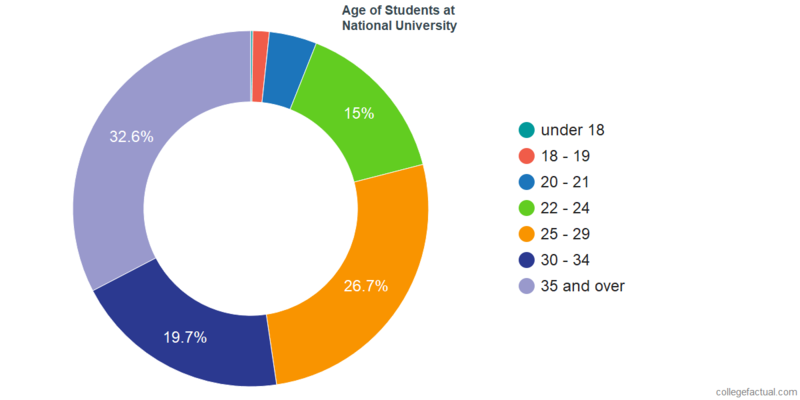 Analyze the age range of National University students with the following chart. Broadly speaking, diversity is the word we use to describe a mixture of individuals and ideas, and the traditions, belief systems and cultures that come with them. Diversity can be a huge benefit to students, as it not only exposes them to new ideas and ways of thinking, it prepares them for the varied workforce of tomorrow, as well as inspires creativity and innovation. Is National University supporting and attracting students from all backgrounds? Even a school with great racial, ethnic and geographic diversity may not be diverse when it comes to the economic backgrounds of their students. To get a better idea of how National University is supporting low-income students check the Financial Aid Page. How important is diversity to National University? In order to achieve the most benefit from diversity on campus, seek out schools that are not only promoting diversity by actively recruiting students and hiring faculty from minority groups, but are also promoting an environment where there is meaningful interaction between different groups.